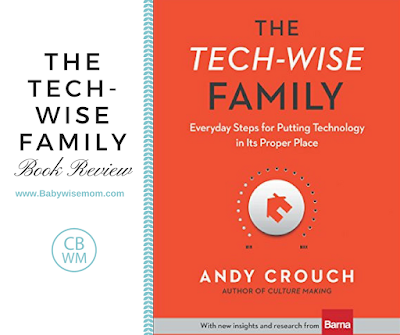 This is a review for the book The Tech-Wise Family: Everyday Steps for Putting Technology in Its Proper Place (affiliate link). I really enjoyed this book. 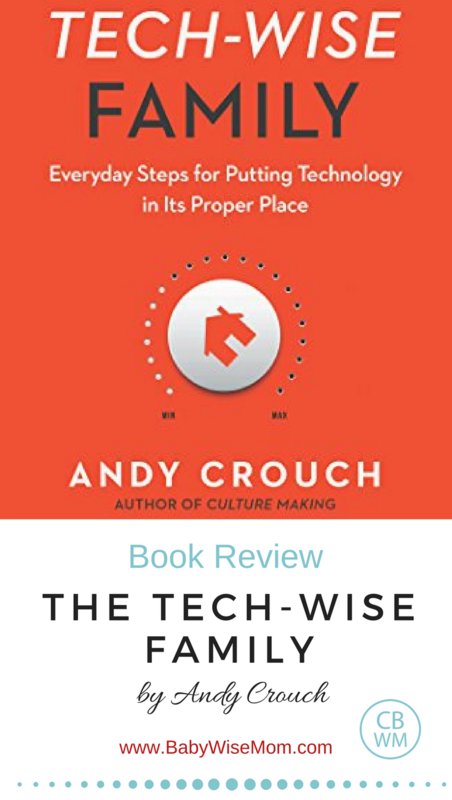 One of the things I really liked about it is that the author, Andy Crouch, is very reasonable and stated often that this is what worked for his family and it might not be exactly what you want to do. You may be more strict or you may be less strict. You may keep some things and cut others. It is full of great ideas for how to have technology in your life but not let it consume life in your family. I read this book because as modern parents, we do not have wisdom that has gone before us on the technological front. Most if not all other parenting concerns have been faced for many years and we can ask older parents and grandparents what they did. What worked? We can glean wisdom. With technology, however, we are so new with it that it is a situation where we don’t have the gift of hindsight yet. The author says (I read this on my Kindle, so no page numbers), “But the pace of technological change has surpassed anyone’s capacity to develop enough wisdom to handle it.” This is just how I feel about it. Technology is so fresh, we don’t even really know what we are dealing with yet. Here are some of the rules and ideas about rules I loved from the book. Our Family is Different: “But if there’s one thing our children need to hear from us, over and over again, it’s this: “Our family is different.” I fully agree with this. I agree with this on every level of parenting, and that includes technology. We have to be willing as parents to set rules that we feel are best and stick with them, even if “all the other parents” have different rules. Your children are individuals and need an individual plan. Have Breaks: Have no-technology times. The author had a no tech rule for one hour a day every day, one day of the week every week, and one week of the year every year. At our house, we like to do a technology fast for one week every month. Choose what might work for you and set those rules and limits. Do Not Allow Devices in Bedrooms: This is pretty self-explanatory. We have a “charging station” in our house where the devices go at night. This is something we started years ago. By the time the kids are teenagers, it will have been a part of life for as long as they can remember. It won’t be a big deal. Car Time is Conversation Time: Keep technology out of the car as much as possible so you will use that time for conversations instead. The car is one of the best places for having great talks. I promise you will love that you established this rule as your children age. Other Rules: He had some other rules that are of interest but not what we do at our house. One is to not allow screens in the lives of children at all until age 10. He admits that is extreme, but they did that in their family and loved it. He also talked about pre-recorded music as a bad version of technology. Setting rules isn’t always easy. Our children might fight back. We might even get other parents telling us we are doing it all wrong. Mommy wars are a real thing, and technology rules is not a battle people skip over. You will probably get people who disagree with the rules you set. While it is helpful to know what other people have as rules so you can help consider if your rules are all appropriate, do not give into “peer-pressure” any more than you want your children to. You have to set the rules you think are best for your family, no matter what everyone else is and isn’t doing. This book was a fast read and gave some great ideas and considerations for technology rules to set in your families. It was very accepting of the fact that other people will have different rules and it didn’t make you feel like a bad parent for not agreeing with him or for having other rules in mind. I highly recommend it to get your mind thinking about these rules and to get some good ideas for tech rules in your home.